Our newly installed and professionally landscaped Memorial Gardens provide a non-traditional option for the interment of cremated remains. These gardens provide an unmarked site, no urns or monuments, for those wishing to return to the natural earth leaving no carbon footprint behind. Each burial is recorded and the uncased ashes are placed directly into the ground in one of the two gardens after the family leaves the cemetery. The Memorial Garden unmarked interment of un-encased cremated remains costs $250.00, includes Opening & Closing. 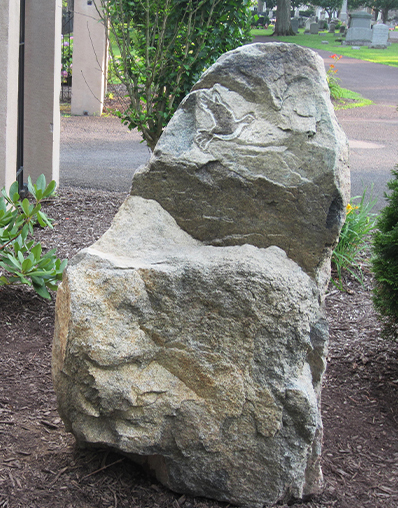 The natural stone sculptures located in both gardens are engraved and installed by Lambertville artist Janice Blayne Paul. The stone sculpture with the Celtic Triskele (or triple spiral) circles with "no beginning and no end" symbolize the continuum of life. The carved stone with the dove represents hope, peace and promise. 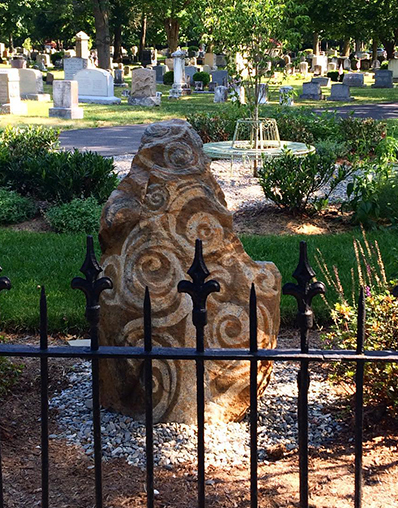 These beautifully landscaped gardens with antiqued benches and contemplative sculpture add a place for reflection while visiting Historic Doylestown Cemetery.